The electric master valve acts as an emergency backup valve. Thereâ€™s a very likely chance that at some point in all the years of you operating your system, the need for this feature will arise. In the event a zone valve sticks on or a main line is ruptured, the master valve will shut down the water flow once the timer has runs its cycle. Without a master valve the potential for continuous water flow is greater. The Rain Bird DV Series valve is our preference. These valves have proven to be dependable, easily serviceable when properly installed and are normally used as both our master valve and as our zone valves. The electric zone valves divide the property into sections. 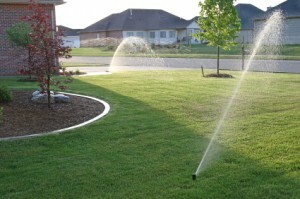 This allows proper watering times to be accomplished based on the type of sprinklers used and the amount of water needed for that particular area of the yard. The Rain Bird DV Series valve is our preference. These valves have proven to be dependable, easily serviceable when properly installed and are normally used as both our master valve and as our zone valves.